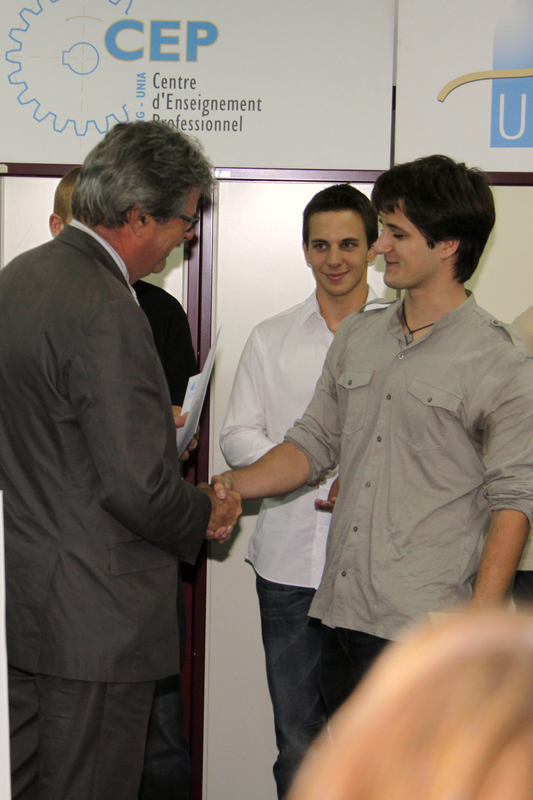 This year again, two CERN apprentices have received awards at the end of their training. CERN’s broad range of technical skills means that it can provide training in a wide variety of trades and professions. Denis Fernier receives congratulations from Pierre-François Unger, Counsel state of the canton of Geneva in charge of the department of economics and health. Denis Fernier and Coralie Husi (right) at the prize-giving ceremony of the Union Industrielle de Genève. Every year, CERN hosts six technical apprentices for a four-year period: three electronics technicians and three physics lab technicians. And every year, at the end of their apprenticeships, one or more of them receives an award for being among the best apprentices in Geneva. 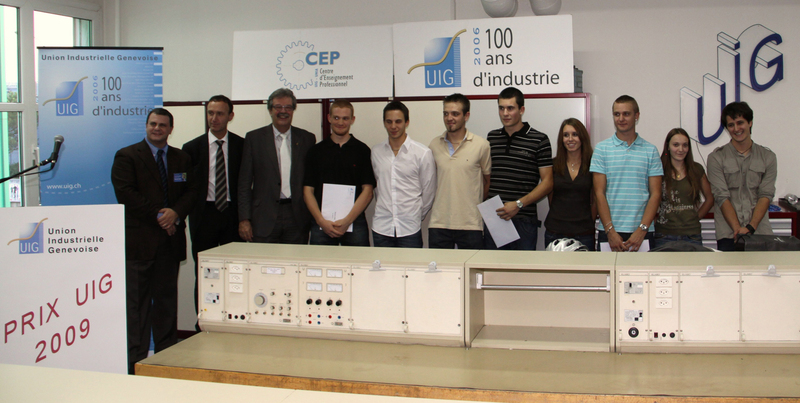 On 23 September, two young apprentices were honoured by the Union industrielle genevoise (UIG) on passing their exams: Coralie Husi, a physics lab apprentice, and Denis Fernier, an electronics apprentice. On 1st October, during the ceremony at which the federal professional qualifications known as the CFC (certificats fédéraux de capacité) were presented, Denis was also awarded the State Council prize for achieving one of the top-ten overall grades in the Canton of Geneva. The apprentices who come to CERN are aged between 15 and 21 and are from a wide range of different backgrounds. What they have in common is their desire to learn a technical trade or profession. During their four years of training they spend three days a week at CERN and the other two days at college, either the CFPT in Geneva in the case of the electronics technicians or the ESPIC in Lausanne in the case of the physics lab technicians. During these four-year apprenticeships, they are assigned a series of about ten work placements designed to teach them various aspects of their trade. The shortest placements can last a month, while those at the end of the training can last up to a year. The placements for the electronics technicians cover areas such as design, execution, maintenance, repair and measurements, while those for the laboratory technicians offer the opportunity to work on all kinds of projects: mechanics, cryogenics, metrology, to name but a few. CERN is home to a multitude of skills. "The nature of the placements varies each year in accordance with availability", explains Jean-Marc Bouché, head of apprentice training at CERN. Thanks to the experience they acquire at CERN, the apprentices are proficient in many areas by the time they graduate. Once they have the CFC in their pockets, they can either start looking for work or go in for further studies. "I always encourage them to continue", says Jean-Marc Bouché. Some of them go on to enrol for engineering studies in Switzerland, as has Denis Fernier this year. "Our apprentices tend to find work in their field fairly easily", says Jean-Marc Bouché. "You can find them everywhere: a few are taken on at CERN, while others find work in universities or research laboratories." The secret of CERN’s successful apprenticeship programme lies in the commitment of the personnel involved. The placement supervisors play a key role in all this, in their efforts to pass on their know-how and expertise to the young apprentices and in the time they are willing to devote to these activities. Each year, CERN also offers two three-year administrative apprenticeships in information and documentation. Information on the apprenticeship programme is available on the CERN website.